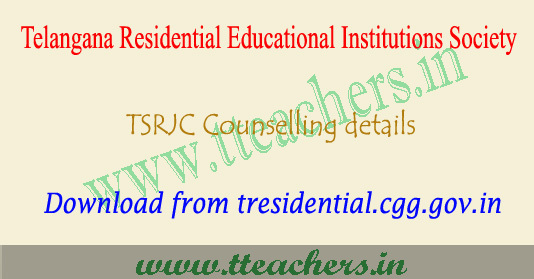 TSRJC counselling details 2017, final phase certificate verification dates : TREIS has been announced tsrjc final phase counselling schedule for left over vacancies after tsrjc 2nd counseling in first year intermediate in 02 TSRJCs & 06 upgraded TSR Schools for the Academic year 2017-2018 through counseling. Candidates are called for admission counseling in the ratio of 1:4 in all the categories to the available seats. Hence, admission is not assured for all shortlisted candidates. Admission will be provided based on the merit, rule of reservation. TSRJC 2017 final phase Counseling will be conducted on 13.07.2017 for boys both MPC & BPC at TSRJC, Sarvail; and for girls both MPC & BPC on 13.07.2017 at TSRJC, Hasanparthy, Warangal(U) district. Eligibility : The candidate must have Passed in the qualifying examination in the first attempt in March 2017. OC candidates must secure minimum of GPA 6 and BC, SC, ST candidates must secure minimum of GPA 5 in SSC or equivalent Examination. Telugu Medium candidates opting for English Medium should get minimum of GPA 5 in English subject in their qualifying examination i.e. SSC. 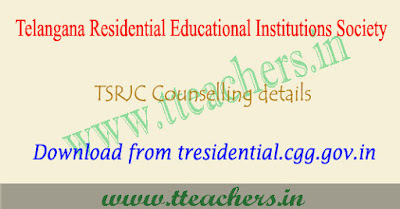 Candidates can view of details about TSRJC counselling details 2017, final phase certificate verification dates, tsrjc cet counselling dates 2017, ts residential college final phase counselling schedule download, fee amount, counselling place, tsrjc counselling 2018 and other details available through the official website.